The City of Edmonton officially announced today its intention to annex a large area south of our current boundaries (you can listen to the press conference here). The plan would see 120 km2 west of the QEII highway annexed, an area which includes the Edmonton International Airport, and about 36 km2 east of the QEII annexed, which would include most of the area between Edmonton and Beaumont. According to Mayor Mandel, the new space would be used for both residential and industrial development. You can read much more about the news here, and be sure to check out the City’s page on the proposed annexation. It is estimated that the annexation could be completed in as little as two years. You won’t be surprised to hear that I’m less than enthusiastic about the news. 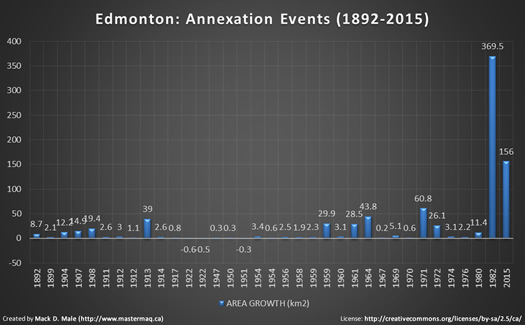 I’ll write more about that specific proposal in the future, but for now I thought it would be useful to take a look at Edmonton’s previous annexations. I have included the proposed annexation in the data below however, to give you a sense of where it fits in (I went with 2015 as the year). 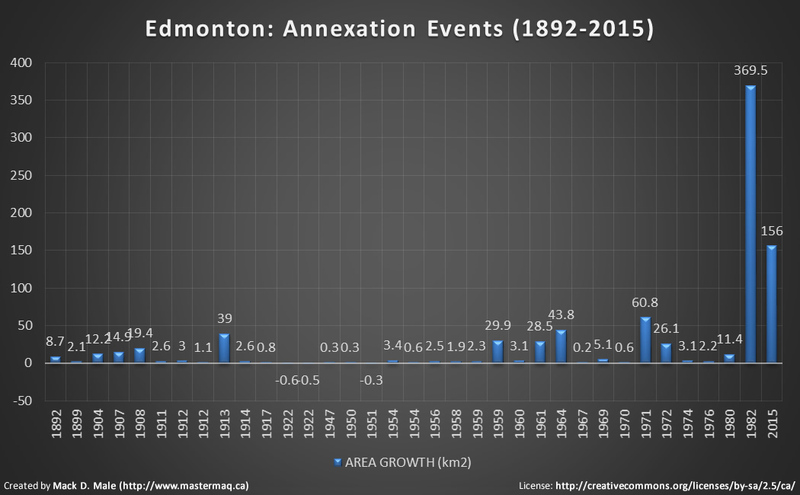 There have thus far been 31 annexation events in Edmonton’s history, according to a document prepared by the City’s planning department. That includes the incorporations of both Edmonton and Strathcona, as well as three temporary separations. Most of those annexations were relatively small, with an average annexation area of about 21 km2. Take out the 1982 annexation however, and the average drops to just 10 km2. As you can see, the annexation in 1982 was unusually large – it doubled the size of our city. The proposed annexation in the south would handily come in as the second largest annexation in Edmonton’s history. The left axis and blue line shows the growth in Edmonton’s population, while the right axis and red line shows the growth in Edmonton’s land area. While our population has risen steadily, annexations have been much less consistent. 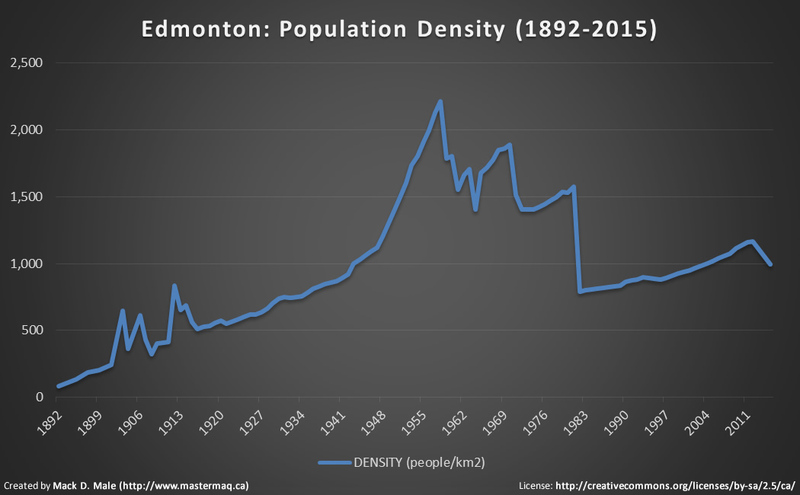 When the Town of Edmonton was incorporated in 1892 it consisted of 8.7 km2 of land and was home to about 700 people, giving us a population density of about 81/km2. Today, with a population of nearly 818,000 and a total area of about 700 km2, we have a much higher population density of roughly 1,167/km2. That’s not the highest it has ever been, however. 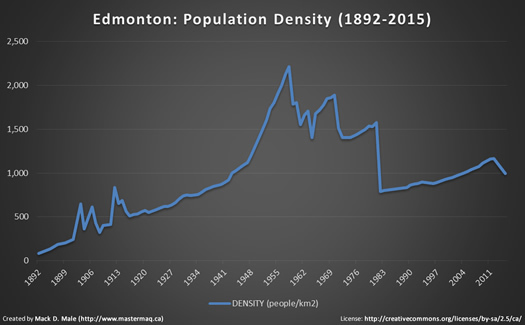 Edmonton’s population density peaked in 1958 at about 2,212 people/km2 and has been falling ever since. There are a couple of key events to point out. 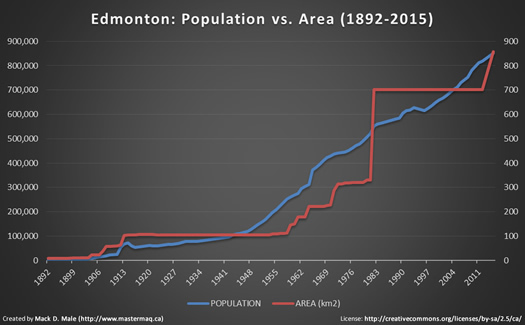 The amalgamation of Edmonton and Strathcona in 1912 is noticeable thanks to a jump in the population. The annexations in 1959 of Terrace Heights, Ottewell, Terwillegar Park, and Riverbend marked the start of our population density decline. The jump back up in 1964/1965 was due to the annexation of Jasper Place, which brought about 38,000 residents to Edmonton in addition to more space. The large drop in 1982 is extremely apparent, and while the population density has slowly been creeping back up, you can see that the proposed annexation would cause it to decline once again. I absolutely agree with Mayor Mandel that a strong Edmonton is a strong region, but I don’t necessarily agree that Edmonton needs to acquire more land in order to remain strong. Supporters of annexation may suggest that Edmonton’s declining proportion of the region’s population is proof that buyers are not finding what they’re looking for within the city so they’re going elsewhere. 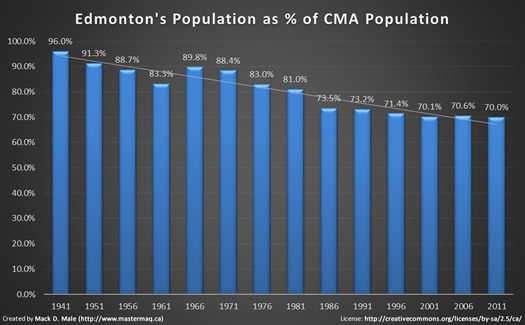 What’s clear is that there has been a decline in the proportion of people living in Edmonton-proper versus the surrounding areas. What’s less clear is why that has happened. While Edmonton has not annexed any land since 1982, there have been 6 annexations by other municipalities in the region in the last 15 years.